was a gifted child who studied and practiced Dharma intently from an early age. Already quite learned by the age of twenty, he became a monk and studied the sutras and tantra intensively for a further ten years. At thirty, he went to Daklha Gampo--Gampopa's monastery--to receive teachings from him. Although this was an historic meeting of two great Buddhist bodhisattvas emanating on Earth with a profound purpose, Gampopa nevertheless first made Dusum Khyenpa train formally in the foundation practices of the Khadampa tradition and, following that, in the general philosophy of the sutras. This set a fine example for all future Kagyu followers and showed the need for the correct basis of knowledge even when--especially when--one does the most powerful of Vajrayana practices. The first Karmapa received empowerments and instruction in the Hevajra tantra and spent four years in strict retreat, training in the peaceful stability (shamatha) and profound insight (vipasyana) aspects of meditation. He then received the full transmission of the inner instructions of the Kagyu tradition. In nine days he absorbed what Naropa had received over 12 years from Tilopa. Rechungpa, the 'moon-like' disciple of Milarepa, also instructed him, principally in the Six Yogas of Naropa. His attainment in one of these--tummo, inner-heat--was particularly boosted by his own natural compassion and produced rapid results. Following his teacher's instruction he then went away to meditate. Gampopa eventually died and Dusum Khyenpa returned to Daklha Gampo to honor his remains. He had a powerful vision of his teacher and knew that it was time to implement one of his final instructions: to go to the place where he would achieve enlightenment--Kampo Kangra--and there to practice mahamudra. He promised that he would live until the age of 84, in order to benefit the Dharma. He achieved enlightenment at the age of fifty, while practicing dream yoga. He had a vision at that time of the celestial beings (dakinis) offering him a vajra crown woven from their hair. 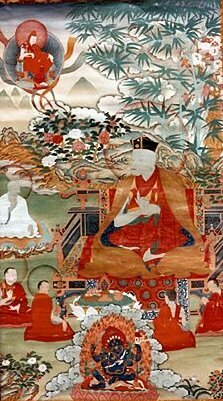 His name--Dusum Khyenpa--means 'Knower of the Past, Present and Future', referring to the total lucidity he attained at enlightenment, giving him knowledge of the three modes of time, and the 'timeless time' of enlightened awareness. From then onwards his teaching activity was intense. At the age of 58 he founded a monastery at Kampo Nenang. He later established an important seat at Karma Gon in eastern Tibet and, at the age of 74, another seat at Tsurphu in central Tibet, in the valley of the Tolung, which feeds into the Brahmaputra. It is interesting to note, in the light of the 16th Karmapa's prediction letter, that the abbot of the Buddhist monastery at Bodh Gaya, in India, the place of the Buddha's enlightenment, sent a conch shell to Dusum Khyenpa at Tsurphu, as a token of the latter's significance for buddhadharma. This conch shell symbolism is found in many stories of the sixteen Karmapas. The first Karmapa, Dusum Khyenpa, made predictions about future Karmapas. In particular, he was the first Karmapa to present a prediction letter detailing his future incarnation. He gave it to his main disciple, Drogon Rechen, predecessor of the Tai Situ line (they were only called Tai Situ after this title was conferred by the Chinese emperor in the early 15th century). He passed away at the age of 84, as predicted. His heart was found intact in the funeral pyre and some of his remaining bones bore self-manifesting shapes of Buddhas. (The similarities with the passing of the 16th Karmapa are remarkable.) Among his other main disciples were Tak-lungpa, founder of the Ta-lung Kagyu, Tsangpa Gyare, founder of the Drukpa Kagyu (widespread in Bhutan these days) and Lama Khadampa Deshek, founder of the Katok Nyingma lineage.